Would you like chickens with that? : Lunchtime FAIL - with amusing results! 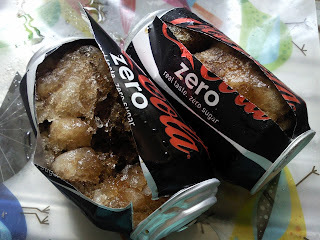 Mental note to self - when you put cans of soft drink in the freezer to chill them fast because someone is coming round for lunch in 15 minutes, PUT THE TIMER ON TO REMEMBER TO GET THEM BACK OUT AGAIN! And let me tell you, frozen Coke is a bugger to get out of your freezer - the devastation spread across 3 shelves and down into the drawers at the bottom. I won't be freezing cans again any time soon!